She was about the last person you’d ever want to see walking toward your bar. An anti-booze crusader with a hatchet in hand and the Lord at her side (or so she insisted), Carrie Nation made a fearsome name for herself in the early 20th century by terrorizing saloon owners and promoting the message of the Women’s Christian Temperance Union through high-profile acts of vandalism and at least 30 arrests. 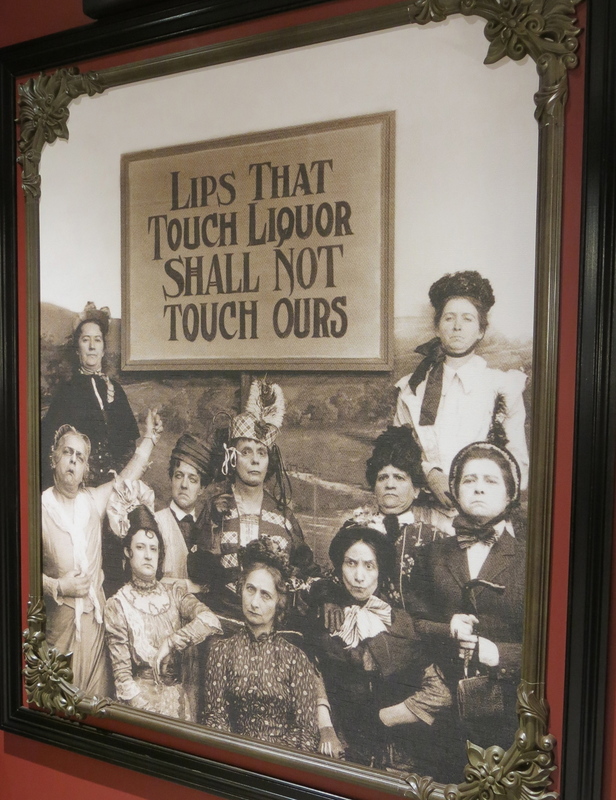 From about 1900 to 1910, this imposing, six-foot-tall Kansas woman brought the temperance movement to violent, radical heights by storming into bars and smashing fixtures and liquor bottles with a hatchet. Her initial targets were saloons that violated local laws prohibiting the sale of alcohol, but Carrie’s “hatchetations” expanded to any establishment selling liquor, legally or not. She might not seem like the most obvious figure to name your bar after. But apparently the Carrie Nation Cocktail Club appreciates history and irony in equal measure. Having opened in Beacon Hill this past spring, Carrie Nation (the bar) is everything that Carrie Nation (the person) would have abhorred. With its flapper-era drink list and opulent décor, Carrie Nation is a modern-day tribute to the 1920s – an era that would have inspired both celebration and consternation in its namesake. No doubt, Carrie would have applauded the ratification of the 18th Amendment, had she lived to see the day (she died 9 years before Prohibition went into effect). But there weren’t enough hatchets in the world to destroy all the illegal bars that sprung up in its wake. And not even Carrie herself possessed enough self-righteousness to shame all the cops who accepted bribes that allowed such establishments to operate, or the judges and politicians who benefited by looking the other way. Carrie sells a would-be drinker on the merits of an ice cream cone. But Carrie Nation isn’t just another Prohibition-themed bar serving up old-school cocktails. 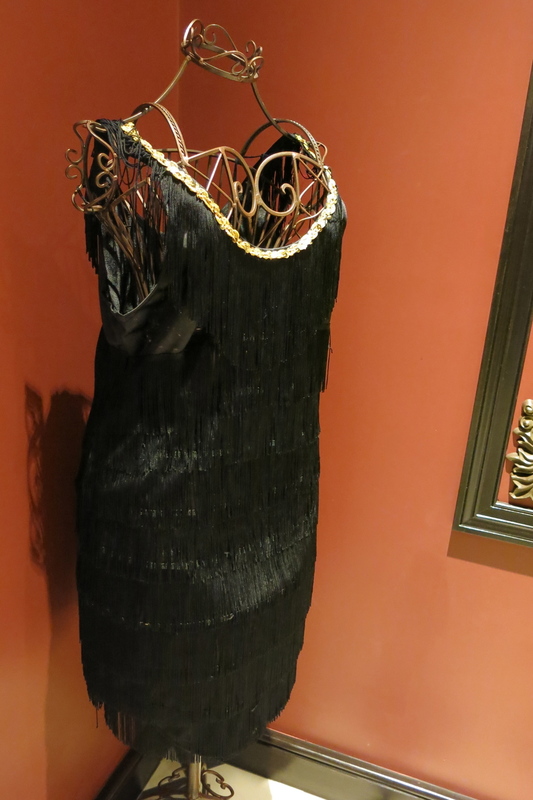 It captures the Roaring Twenties in all its glitz, glamour, and legendary style. The notion of drinking in the 1920s may provoke images of makeshift, backroom speakeasies, but Carrie Nation, with its mammoth size, evokes the palatial luxury hotels and dining establishments that reflected the decade’s gaudy extravagance. There’s a large, open dining room with round tables and comfortable leather booths. Long, red velvet drapes and a handsome dark brown and cream color scheme hearkens back to a time when people donned their finest duds for a civilized night out on the town. Ornate hanging lamps cast a warm glow over the whole area. The Beacon Room, a second dining area, is separate and smaller, but still spacious and grand. 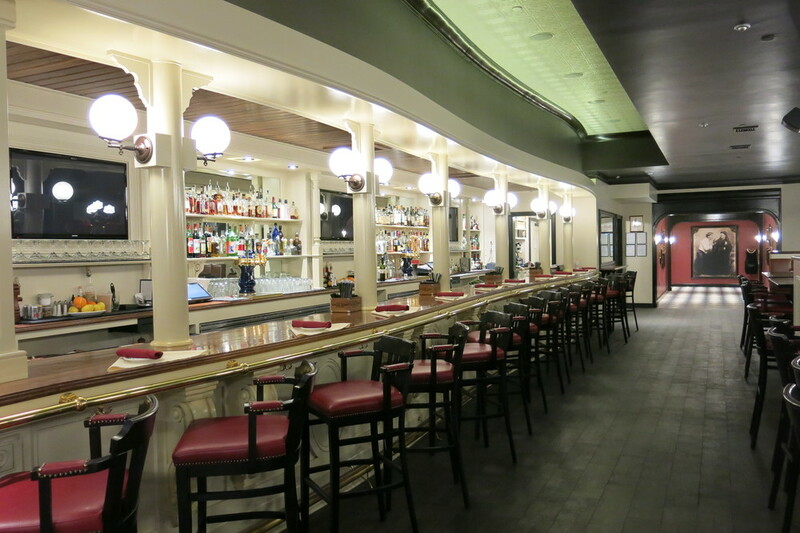 A long, beautiful bar – an improbable sight in the 1920s – seats 17, while five tables round out the bar area. While the décor offers a glimpse of the gleaming luxury of the Jazz Age, Carrie Nation’s cocktail list largely recalls the unsavory side of the 1920s. The drinks are categorized under headings like Drys & Wets, Politicians & Power, and Enforcers & Instigators, conjuring images of Treasury raids, gangland hits, and crooked cops. Yet Carrie Nation’s cocktails are garnished with a distinct local flair – many are named for early 20th-century-era Boston icons, and drinking your way through the list is like stumbling into the grittier corners of the city’s history. 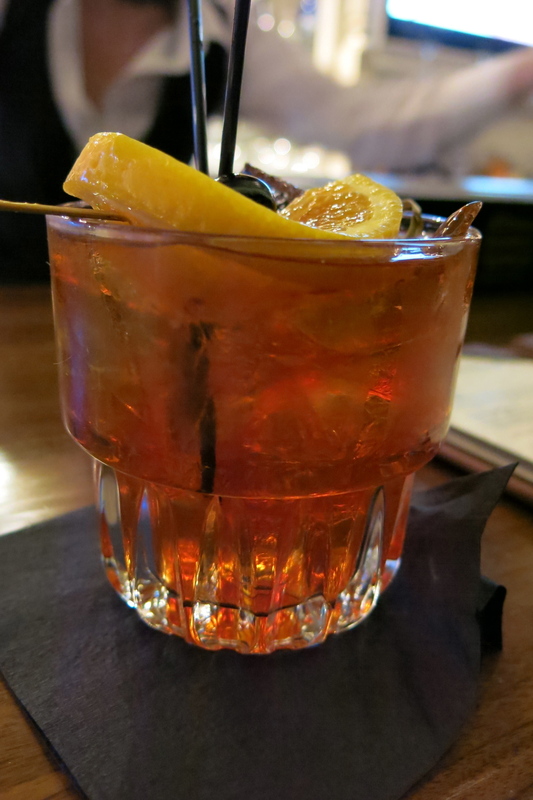 And Boston certainly had its share of drink-worthy figures, as I discovered a few weeks back when I stopped into Carrie Nation with a handful of coworkers. With me were my friends Andy, Jen, Keena, Jen, John, Katie, and a few others (there won’t be a quiz). In the annals of Boston history, it would be difficult to find a more colorful and controversial character than four-term mayor and one-term governor James Michael Curley. Few Boston politicians are so equally identified for their popularity and corruption ­­– he even won an election while serving a prison term. Curley was known as the Rascal King, and the drink bearing his unflattering epithet combined spiced rum, brandy, peach schnapps, and lemon. Peach was the dominant flavor in this one, but the brandy gave it depth and the rum provided some bite. Martin Michael Lomasney didn’t have Curley’s reputation for graft, but his political clout remains unrivaled in Boston politics. The boss of Boston’s Ward 8 for nearly 50 years, Lomasney was nicknamed “the mahatma” for his influence over all matters affecting the old West End. The Boston Mahatma is Carrie Nation’s take on a Rob Roy, combining Glenfiddich, Punt e Mes, Maraschino liqueur, and Angostura bitters. A little heavy on the Punt e Mes, this one was too bitter for my liking. Of course, politicians weren’t the only public figures known to loosely interpret or even outright break the law. Boston police officer Oliver Garrett, whose lavish lifestyle far exceeded his $40 a week salary, was known as the Million Dollar Cop. Garrett was widely suspected of padding his regular income by accepting bribes from the speakeasies and brothels he was supposed to be shutting down, though he was never charged with a crime. Katie ordered the drink named in his honor, a mix of Hendrick’s gin, lemon, Chambord, egg, raspberries, and champagne. By far the prettiest drink of the night, the Million Dollar Cop was rich in its own way – bursting with raspberry flavor, the egg gave it a creamy texture, and the bubbles added a sense of luxury that Garrett no doubt would have appreciated. Al Capone was the most notorious gangster of the 1920s, and even now, his name is synonymous with organized crime. But Boston had its own big-time mob boss – Charles “King” Solomon. A prominent nightclub owner, Solomon was also a racketeer who controlled bootlegging, gambling, and narcotics rings in and around the city. 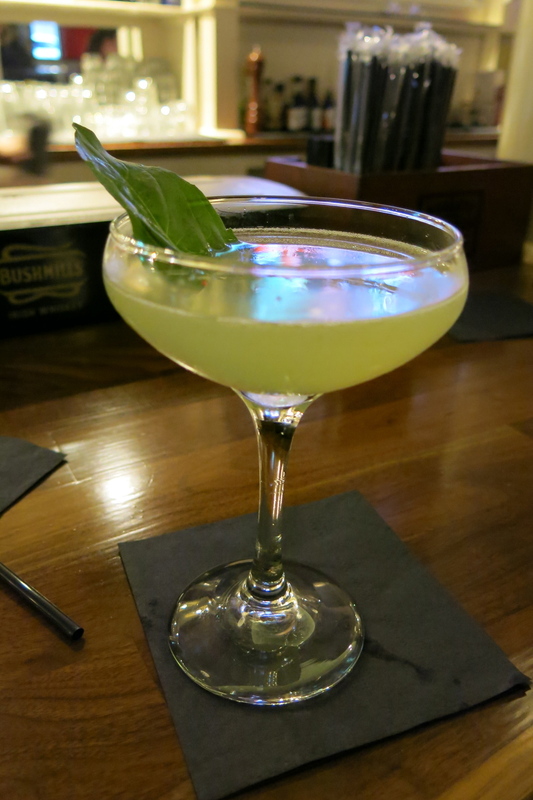 Carrie Nation’s King Solomon, ordered by Andy, was a vibrant mix of barrel-aged tequila, house-made limoncello, mint, and ginger. With an up-front honey essence and a strong tequila bite, Andy described it as “explosive,” which seems appropriate for a drink named after a mob kingpin. Tempting as it might be condemn the actions of an underworld boss, we all know who keeps those guys in business – and in the 1920s, that was anyone wanting a drink. We were, as historian Ken Burns noted in his PBS Prohibition series, a “Nation of Scofflaws.” The term scofflaw, incidentally, was coined after the Boston Herald sponsored a contest to give a name to this new class of common criminal (two Boston residents came up with “scofflaw” and split the $200 prize). The Nation of Scofflaws cocktail combined rye whiskey, Lillet Blanc, pomegranate grenadine, and lemon. The pomegranate grenadine was a little intense, but it was good overall. While the 18th Amendment banned the production and sale of intoxicating liquors, it was the Volstead Act that specified which liquors would be prohibited, which would be allowed, and how the law would be enforced. How appropriate, then, that the Volstead cocktail was difficult to swallow. Made with extra dry rum, yellow chartreuse, maraschino, a house lemon cordial, and grapefruit bitters, it was dry and sour – a lot like Prohibition. The bitters doubled down on the grapefruit, making this one a little tough on the palate. Not all of Carrie Nation’s drinks are inspired by those who flouted the law. The Archers Evening Law, in contrast, pays tribute to the founder of nearby Suffolk Law School. When Gleason Archer, Sr., opened Suffolk in 1906, it was one of the only law schools in the country to offer night classes. Jen ordered the drink named in his honor, a fresh and fruity mix of blueberry vodka and a house lemon cordial, garnished with a fragrant leaf of basil. Along with their many thematic concoctions, Carrie Nation also has a selection of straightforward, time-honored cocktails. John opted for the “Old Fashioned, Old Fashion.” The name might seem redundant, but considering the ghastly incarnations this poor drink has suffered through, it’s worth pointing out that this is a traditional recipe – rye whiskey, bitters, simple syrup, and a lemon peel. No splash of soda, no graveyard of muddled fruit; just a faithful rendering of one of the oldest cocktails on record. Keena kept the classics going with a vodka Martini. She reveled in the three huge olives while I averted my eyes (I despise olives). While the Old Fashioned and the Martini can trace their origins to the 19th century, the Orange Blossom was actually a product of Prohibition. That’s when bartenders started employing heavier mixers to mask the horrendous taste of poor-quality, homemade spirits. Though typically made with gin, orange juice, and sweet vermouth, Carrie Nation’s Orange Blossom uses Ketel One Oranje in place of the gin and Punt e Mes for the vermouth. This one was a bit challenging; I think the orange-flavored vodka was overkill. If none of the 20 offerings on the cocktail list appeal to you, the bartenders seem more than capable of whipping up something on the spot. One of the best drinks of the night arrived when Katie asked for advice on what to order. 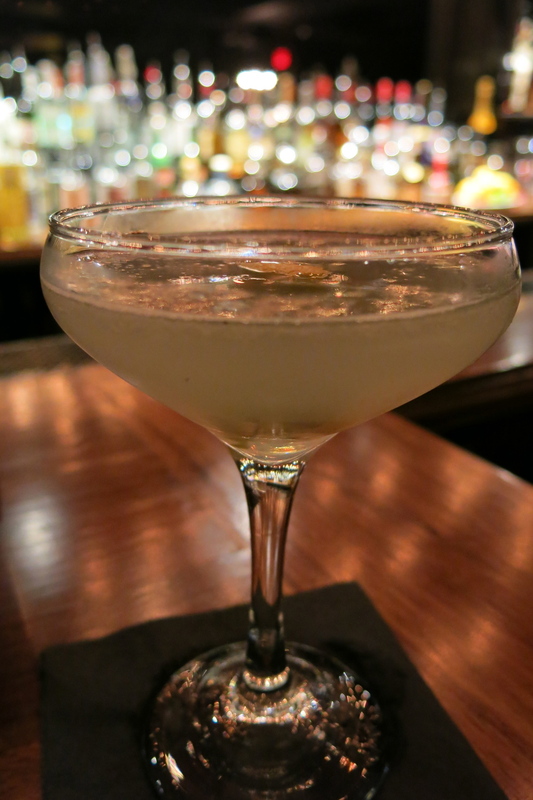 After inquiring about Katie’s preferred spirits, our bartender served up an excellent drink made with Hendrick’s gin, Prosecco, St. Germain, and lemon, with a cucumber garnish. An elegant conclusion to the evening, Katie’s drink was a combination of elements you’d be hard-pressed to find in the 1920s – legal, top-shelf liquor, made with fresh ingredients by a knowledgeable bartender. It is a stunning irony that an era flush with exciting new freedoms – the mobility afforded by automobiles, the luxury of hearing a baseball game on the radio, the purchasing power of the average citizen – is remembered more for what you could not do. Big cities pulsated with dazzling sights, sounds, and diversions, and yet Americans were forced underground – often into basements and stockrooms – if they wanted a beer. This paradox was not overlooked by the people at Carrie Nation. While the main room is awash in Gatsby-esque splendor, you only need to turn the corner and head toward the long, burgundy curtains at the end of the hall if you want to immerse yourself in the boozy underside of the Roaring Twenties. And you don’t even need a password to get in. Carrie Nation’s backroom “Cocktail Club” has all the glamour we associate with a speakeasy and, thankfully, little of the reality – no sawdust on the floor, no bathtub gin, no chance of getting busted. Still, it exudes that shadowy sense of intrigue that we associate with an illicit bar, and it stands as much in contrast to the main restaurant as the illegal bars of the 20s did to their glittering surroundings. 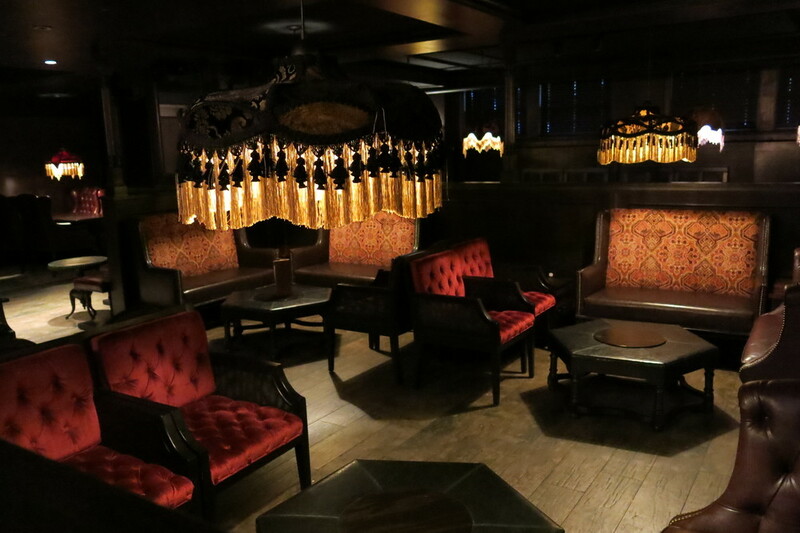 Considerably darker and more intimate than the main area, the windowless speakeasy is dimly lit with antique, tassled lamps. There’s a smaller bar with 13 plush, burgundy chairs. Ten stools sit opposite the bar, with plenty of shelving for your drinks if you’re hanging around and chewing the fat. Beyond that are large but cozy seating areas, handsomely outfitted with leather couches, loveseats, and chairs. There are even two pool tables. I could tell right away I was in good hands back here. Returning to the “Classics” section of the cocktail list, I opted for a drink that dates back to at least 1916 – the Aviation. "I’ve been drinking those a lot lately,” Kristina mentioned. I was encouraged to hear this. Even better – when I said I’d never tried one before, her response was swift and confident: “Ohhhh, I’ll make you a good one.” And that she did. This mix of Beefeater gin, Maraschino liqueur, crème de violette, and lemon was fantastic. The crème de violette, difficult to find and thus often omitted from modern versions of the drink, was smooth and subtle, lending it a floral essence and a pale blue complexion. I requested Kristina’s counsel on what I should order next, and she recommended one of the oldest drinks in the book – a Gin Fizz. Made with Tanqueray gin, simple syrup, lime, egg white, and soda, this was a worthy follow-up to the Aviation. The egg white gave it a creamy texture, but the soda countered with a pleasant crispness. A Luxardo cherry served as a classy garnish. A visit to the speakeasy was the perfect way to round out my Carrie Nation experience. I’d been finding the cocktails a little uneven up until that point; some were really good, while others focused too heavily on bitter ingredients (though in all fairness, I should probably just stop ordering drinks with chartreuse and Punt E Mes, since my reaction is nearly always the same). But the best cocktails were the oldest ones; the no-frills Old Fashioned, along with the Aviation and the Gin Fizz deftly made by Kristina, prove that no matter how dizzying the heights of modern mixology, the classics are sturdy enough to endure anything – Constitutional amendments, passing fads, evolving tastes, the general passage of time.